LatinArt.com - Interview with Diana C. du Pont, Curator of Modern & Contemporary Art, Santa Barbara Museum of Art, California. by Bill Kelley Jr.
Interview with Diana C. du Pont, Curator of Modern & Contemporary Art, Santa Barbara Museum of Art, California. 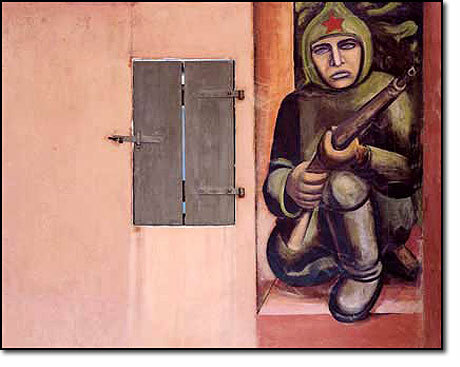 BK: I guess ití­s particularly risky considering that of the three murals that Siquieros painted in Los Angeles, this is the only one that remains fully intact. One was totally destroyed and the other (América Tropical) is a shadow of its former self. DD: But, what would have happened if we backed away and a new owner, who had no appreciation for art, moved into the house? We were lucky that the current owners were very knowledgeable about art and about museums, so they were eager that this landmark be preserved. BK: Thatí­s true. The Museum itself has been very active, not just exhibiting but also collecting Latin American art. Can you talk to us about this? DD:The Museum has been collecting Latin American art since it was founded in 1941. The Latin American collection got a boost when Dr. MacKinley Helm, an early scholar of modern Mexican art, who also had a house here, left us a large part of his collection. The Museum already had a history of exhibiting Mexican art, in particular, and that was my launching pad to encourage the Museum to continue in this direction. I had worked in this area before coming here, having previously put together a show on Graciela Iturbide at the San Francisco Museum of Modern Art and a show of Eugenia Vargas at the University Art Museum, California State University, Long Beach, among other things, and so I was already excited to work in this field that was so rich yet so under-represented. The Museum already had a platform from which to begin and so our philosophy had to be that we "build on our strengths." The Museum has been focused on the art from Mexico, particularly modern. When I came I wanted to keep that trend going but also broaden it out to Central and South America. Thatí­s why the Torres-Garcí­a acquisition was so important. We also acquired an important Miguel Angel Rí­os and a Luis Cruz Azaceta as well. As far as weí­re concerned, the field is wide open. BK: It is wide open yet some themes persist...regional vs. international, etc. How are museum collecting and exhibiting practices played out in light of increasing curatorial and academic attention in the field? DD: There is an increasing presence for Latin American art in museums, which is fabulous! However, I would challenge people to go around museums in this country and show me where art from Latin America is routinely on an equal footing as art from the United States or Europe. Ií­d like to see that. Our Museum is small and nimble enough that we can exhibit works in all media and across time and, in a sense, be borderless. We doní­t have different departments creating artificial boundaries. Weí­re very lucky in that regard, because this is not the norm. Have you noticed that museums in this country all depend on departments of Latin American art? Within Modern & Contemporary, we do not have departments. Ií­m not a Latin American art curator per se and yet sometimes we do more with Latin American art, often integrating it with art from other regions, than museums that have dedicated departments. So yes, curators and academics are talking about dismantling bordersó letí­s see more of it in practice. Besides the clear issue of creative invention, thatí­s what compelled me, in part, to exhibit someone like Gunther Gerzso. We know about Siqueiros, Orozco, Rivera and Kahlo and we see much contemporary art, but what do we know about what happened in between? BK: That departmental distinction is very interesting. DD: What makes it happen is the partnership with the curator, your co-workers, the trustees, and the leadership. You all work together and their enthusiasm and support have helped us do this. A lot of people have misperceptions of what Santa Barbara is like - very conservative, affluentó so of course, can you imagine Siqueiros in Santa Barbara!This is a surprising place.